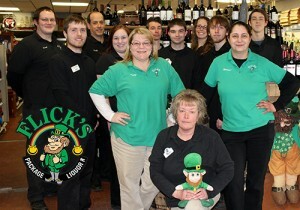 For the past 60 years, Flick’s Package Liquor, Inc. has been a vital part of the Lambertville community. More than just your average liquor store, we create lasting memories from our gift baskets and party planning to our outstanding customer service. At Flick’s, our customers know they are getting quality products at a fair price. Flick’s Package Liquor, Inc. began as a small store on Summerfield Road. We quickly outgrew the space and continued our legacy by opening our current store on Sterns, near Secor Road. Flick’s may have expanded, but our philosophy has remained the same. Customers are always first at Flick’s. We believe that the key to running a successful business is to give our customers a reason to return. As a family owned and operated business, we want Flick’s to be both a wonderful place to shop for our customers and a great employer in our community. Our employees are truly a part of the Flick’s team. Flick’s continues our reputation of having a well-stocked selection of specialty liquors, large wine gallery, and one of the largest beer selections in the Bedford & Lambertville area. Your official party headquarters, Flick’s also carries items like gift baskets, deli/party trays, and a variety of grocery products. We want our store to be the kind of place where great memories are born. We have so many wonderful stories from the time we’ve spent here in Lambertville. If you have a great Flick’s story of your own, send it to us at flicks@flicks4fun.com. We’d love to hear about it. And if you don’t have a story to tell, come in today and make one for yourself. Here at Flick’s, we stock the best brands at the fairest prices possible to ensure that you leave with exactly what you require, every time.